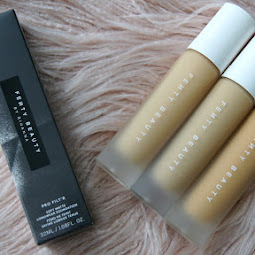 Since the launch of the new Urban Decay Fall products I've been most excited about the new Naked Skin foundation out of them all; when I worked for Urban Decay I found their foundation range lacking something as their cream to powder didn't suit every skin type and their tinted moisturisers oxidised (so even the lightest shade was too dark for the palest of skins). 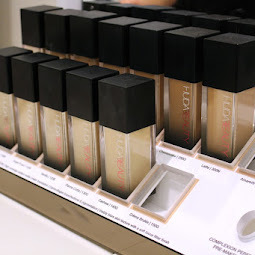 The only foundation I really liked best on everyone was the Surreal Skin Mineral foundation but even so, Urban Decay had to bring out a liquid foundation as their range was lacking in that department. I came back from the launch super excited about this new collection; not only does it come with another positive message (no age limits in beauty) but the collection on first glance had a lot of purple in it; and for those of you who know me by now, I love purple. On to the products then! 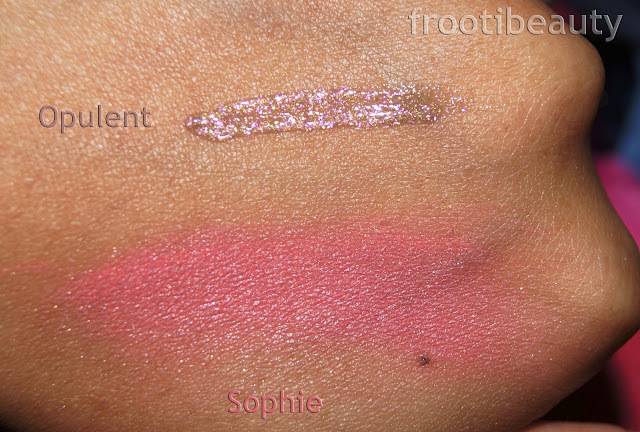 At the launch the Sophie blush struck me as less pigmented than Allure, however this blush I received is super pigmented; after swatching I went to apply some with my brush and ended up with too much on my cheek, so a word of warning: go light handed with these blushes! 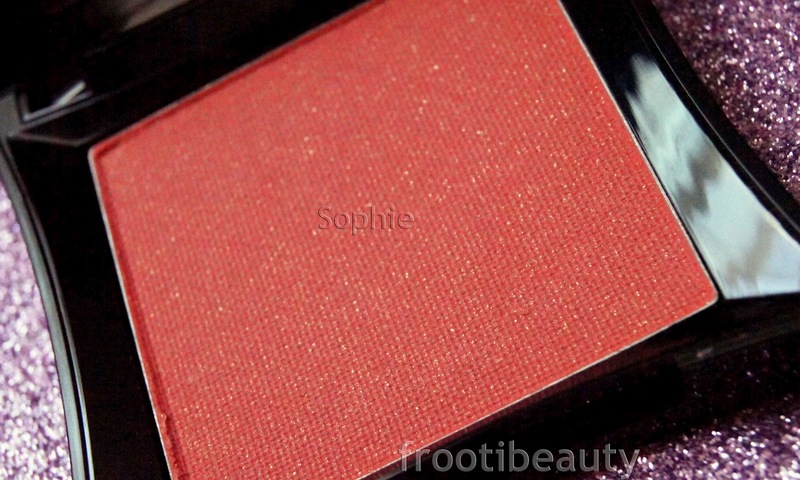 Colour & Pigmentation: Sophie is a coral-pink with golden shimmer and I love it. With flash you see the pink more, however without flash it's a more coral tone. Pigmentation-wise, its super pigmented! Price: At £18 it's about the same price as a MAC blush, however with Illamasqua you know you're getting consistently great pigmentation and longevity, so it's worth it.. plus Sophie is so pretty! FrootiFactor: All in all, I'd give Sophie a 5 out of 5 as I can't fault it! This lipgloss is such an unusual but lovely colour; it should pretty much suit every skintone and I love that it looks different from every angle! You can see in the swatch above how many different colours show. Colour & Pigmentation: Opulent lipgloss is described as a "rainbow beige". To my eyes I can see quite a bit of lilac tones to it too (which of course I love). Pigmentation-wise it's quite opaque, no more than two coats is needed if you wanted to wear the gloss fully opaque, but I prefer wearing it a bit more sheer. Texture: I found it just ever so slightly sticky, which I'm not usually a fan of, however it is less stickier than other brands that claim to be non sticky! 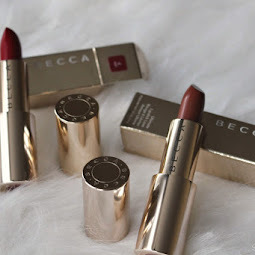 Longevity: Glosses that are stickier tend to last longer and with Opulent there's no strong colour to stain the lips so I think longevity would be 3-4 hours max. Charisma was probably my favourite out of the two polishes as it's more wearable and a slight shade of purple. I do quite like Creator as it's a magical black with gorgeous micro glitter in it, but I'd only wear it going out or to match an outfit I think. 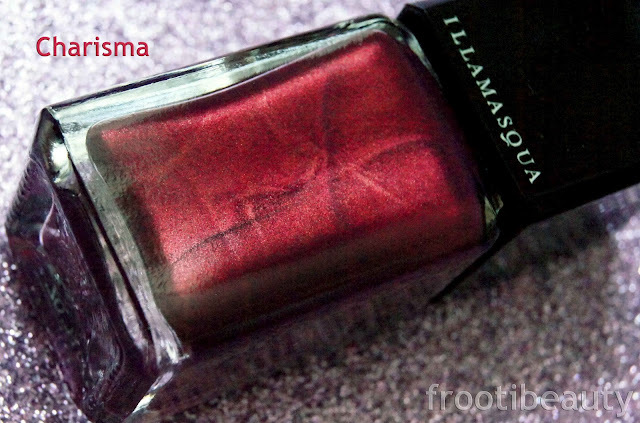 Colour & Pigmentation: Charisma is a deep metallic raspberry pink/purple that is slightly two-tone. It's fairly pigmented, one coat being pretty much opaque, two coats needed max. Longevity: I haven't yet tried the polish for over a couple hours since the swatch at the launch (here) but Illamasqua polishes tend to be fairly chip resistant and long lasting so I'd expect no less from this collection too. Price: At £13.50 it's not cheap but both polishes are a beautiful colour, just looking at the swatches by Fashion Polish makes me crave Creator too! FrootiFactor: I'd give this polish a 4 as it does what it says on the tin! The full range (below) will be available from the 6th September, however if you have any favourites that you'd like to buy before the release date, then you can get tweeting, pinning or liking and the 3 most voted products will be released on the 28th August! Which are your favourites from this range? 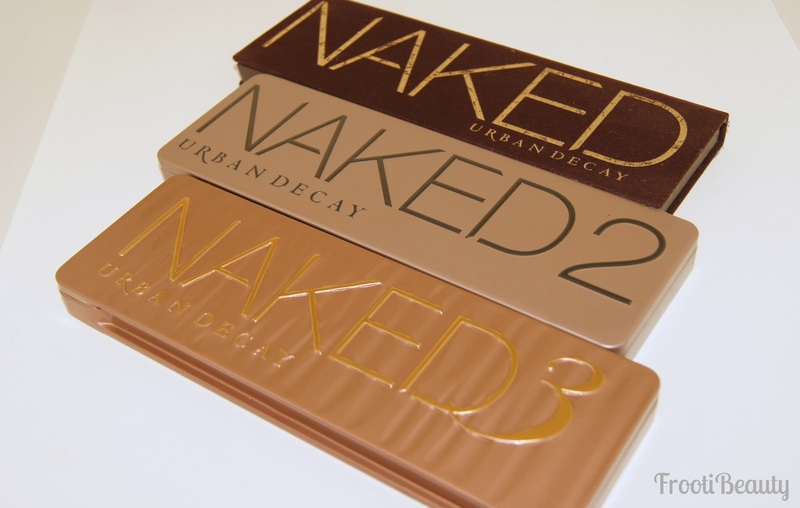 Will you be voting to get your most wanted product earlier? Hi dolls, apologies for the lack of posts lately I've been ever so busy but should be back on track very soon! For those of you looking for inspirational looks for weddings and occasions or to match an outfit, please feel free to browse my makeup looks album here (all with links back to here with written tutorials!) or by clicking on the blogger label makeup looks. 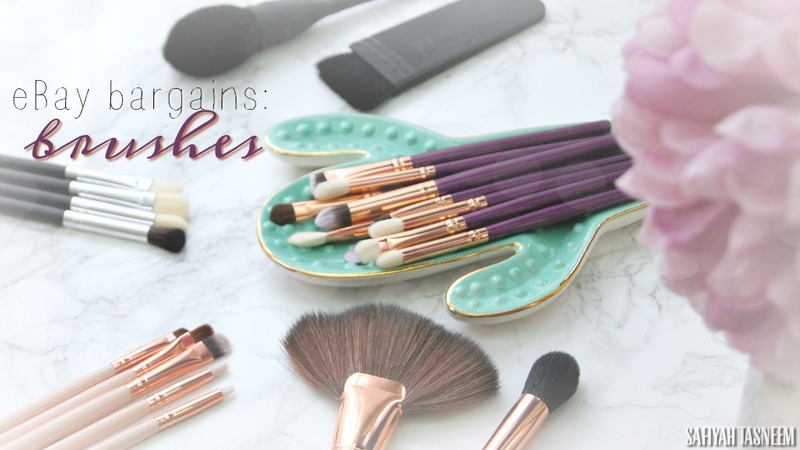 I find that looking through makeup looks is much easier through my Facebook page rather than with blogger. As you may or may not have seen, I've finally reached my 1000 GFC followers and now also on my Facebook page too, so I've been putting together a few goodies and decided to hold a competition for those who would like the chance to win some of my favourite products; the products in this competition are enough makeup to do a full makeup look! To win, create or send a makeup look of your choice; I love seeing creativity and particularly love anything sparkly or purple! Entries MUST be created by yourself, I will check that you created it! Please make sure you are a follower of my blog, this contest is only for Frootibeauty followers. You can enter as many times as you like, but can only win once. Please try and submit at least 2 photos, one closeup of the eye and one of the overall look. This contest is open internationally so anyone can enter. This competition ends on the 21st of September 2012 at 11.59pm GMT. I will publish the winner on my blog once I have chosen my favourite look. I hope to see some great creative looks; I'm not looking for perfection so have lots of fun! Hi my lovelies, this weeks FFF is a green and turquoise look using the Urban Decay NYC Book of Shadows (number 3) as I haven't used it in a while and thought I'd make use of it again! After priming the eye with UDPP & NYX JEP in Milk I applied Maui Wowie (glittery golden-green) to the inner corner, followed by Kush (green) to the rest of the eyelid. 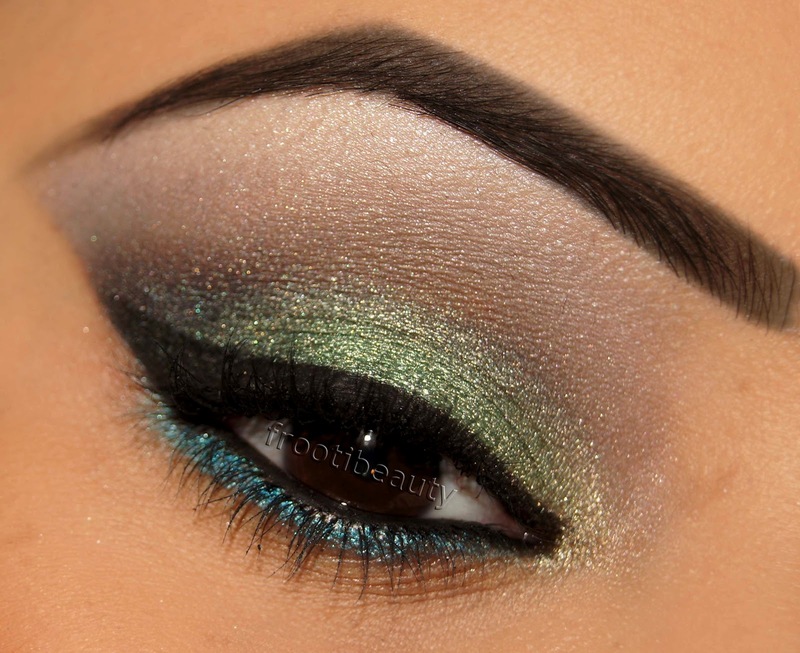 Loaded (dark green) was used on the outer corner and crease, blending inwards slightly at the crease. La Femme Irid White was used on the brow bone and blended down into Loaded. After cleaning up the outer corner with a cotton wool bud, MAC Fluidline was used for the top liner and inner eye followed by UD Electric liner on the lower lashline. I hope you liked this look; please feel free to request any makeup looks you'd like done by either commenting below, emailing, tweeting or writing on my facebook page! 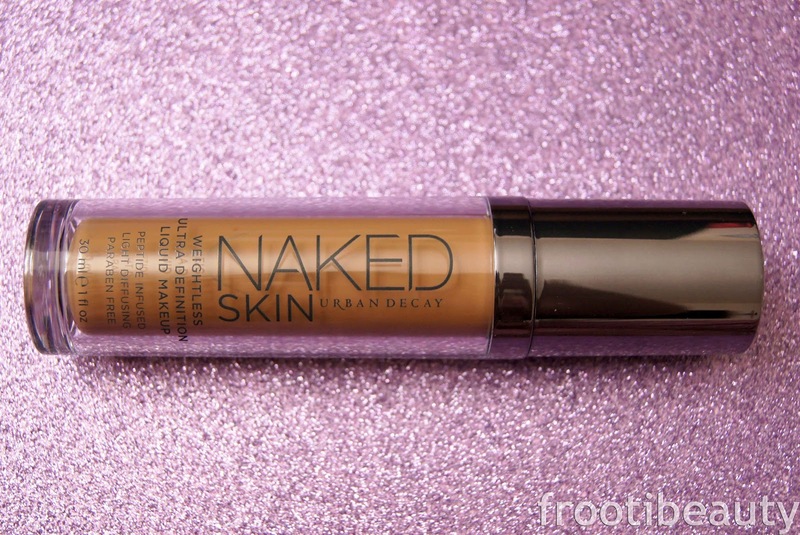 Also, do let me know if you'd like a review of the new Urban Decay Naked Skin foundation used in this makeup look.